In 19th century Normandy, the passionate Emma Rouault (Isabelle Huppert), a beautiful young woman who craves romance and luxury, marries warmhearted but dull country doctor Charles Bovary (Jean-François Balmer) to escape her father's farm. Soon, Emma, whose sexual appetites and social ambitions are unfulfilled by her husband, becomes bored with her lackluster marriage and throws herself into love affairs, first with the suave and wealthy landowner Rodolphe Boulanger (Christophe Malavoy), then with law student Léon Dupuis (Lucas Belvaux). Too naive to see through her lovers' lies and too frivolous with her money, the self-involved Emma finds herself both heartbroken and in debt and has to deal with the consequences of her foolish choices. This faithful adaptation of one of France’s most iconic novels (Gustave Flaubert - 1856) by New Wave veteran Claude Chabrol is a splendid film that was nominated for the 1991 Oscar for Best Costume Design. Madame Bovary has been adapted several times for the big screen, most notoriously by Vincente Minelli in 1949 (starring Jennifer Jones, James Mason and Louis Jourdan). A new version directed by Sophie Barthes (starring Mia Wasikowska) is due in theaters later this year. 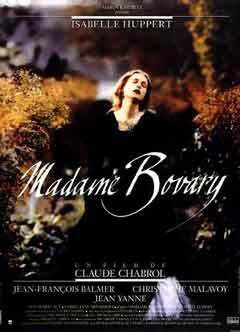 Flaubert is rumored to have said, "Madame Bovary c'est moi!" ("Madame Bovary is me!"). But don't we all have a bit of Emma Bovary in us, a passionate longing for "something else"? Chabrol’s classic is paired with Gemma Bovery, a new film reinventing Emma’s story for modern times.